The Age Melbourne Writer’s Festival is coming to town on the 25th August. Has anyone attended one of these previously? I’m curious as to what it is about and what a person takes out of it. An opportunity to meet with the writers, to listen to their experience and inspiration perhaps? My sole interest? Stella Rimington. I’ve never read her book but I heard she was the Director General of MI5. Wow! She conjures up images of ‘M’ from all the James Bond’s movies. It seems that global warming is really taking its toll. Last year, there was 90cm of snow on Falls Creek. The year before that, about 180cm. This year? A mere 17cm of snow on Friday! Saturday, the visibility was horrendous. And with still so little snow, it seemed wise to drink myself to sleep. But just about then, around a little after dinner, the snow started pouring down. Awake on Sunday, and it was still snowing. Amazing. A green run, Wombat’s Ramble (and also the one that can get me back to the lodge easily, as opposed to taking the ski lift down) got about 10cm of snow, and was open! Quite a number of the blue runs opened. Sunday was just amazing. Sunday was also when we had to leave skiing. Its expected to dump for another two days or so, so I can imagine the beauty of all of this in no time. Its mid-season people. Why do we have so little snow? I was going through the stats on this website and found that the search terms that people got to Melbourne Metblogs to be quite interesting. The biggest keywords seem to be related to Krispy Kreme’s new store in Melbourne. Many people on here have made posts on the donuts. I managed to swing by there and check it out Sunday before last at around 8PM. The line was out the door and around the corner. The drive-thru had a lot of cars waiting. Whirlpool has a fairly active thread (registered users only) where people state that the lines still appear to be up to a couple of hours at peak times. If you are in need to a Krispy Kreme, it looks like you probably should wait another month or get someone from Sydney to fly some down. Is it even remotely possible that Shane Warne has slept with more than 1000 women? I hope readers catch it before her run ends in Melbourne. Adam Sandler’s frat boy antics and loyal viewers – used to his low brow humour – are in for a surprise. I must say i was genuinely concerned the way i was shedding so much tears towards the end of the movie. It’s not a comedy. It’s a tearjerker. Posted in Entertainment, Film | Comments Off on Has anyone seen Click? A short reposting from one of my comment with regards to the photography ban in Southgate. There is going to be a form of protest tomorrow (Saturday) at 10 am to take photos en masse. If you are going to be in the city, and would like to express your disagreement with the ban, bring your camera! See http://highriser.blogspot.com/2006/07/southgate-photos-mark.html or http://www.flickr.com/groups/melbourne/discuss/72157594211274616/ for more followups. I was hanging out in the city of Melbourne yesterday when I spotted a guy taking digital photos of a car. Curiousity caused me to hang around to find out what this guy was up to. Apparantly, he is a tow truck driver who was just about to tow a couple of vehicles. This was along Londsdale street between Elizabeth and Swanston streets. I supposed, during peak hours, the parked cars were supposed to have moved on. Anyway, he was taking photos of the front, sides and back views of the vehicles before towing them. I guess he needed evidence to prove the conditions of the vehicles before he moved them so that the owners will not sue the company for any damages they find later. Posted in Living in Melbourne | Comments Off on Technology! 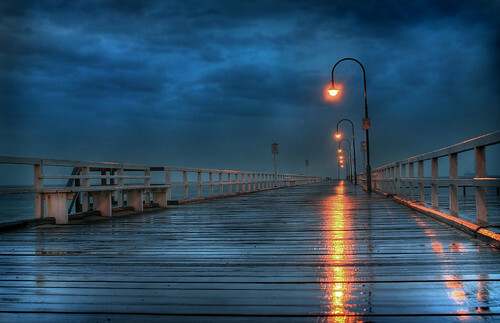 A nice picture taken at the St. Kilda Pier. Picture by dogonnit. Check out some of his other shots around Melbourne. A minor tremor was felt in the Australian video gaming circuit this week as the violent zombie horror game Dead Rising was given an MA15+ (that’s Mature) rating by the Australian Film and Literature Collection. The game has been refused classification in Germany. Is Home Brand for real? Other than the cheapness of their products, what else do you think about Home Brand? Made in Australia? Supporting Australia’s manufacturing/agricultural industry? If you think about any of these, then you are being deceived. The truth is, while their name is “Home” brand and many of their products are produced in Australia. Many of their products are NOT produced or made in Australia. (Remember their three ticks – “Made in Australia”, “Quality Tested” and “Low Price” – many of them actually don’t have the first tick.) For example, their strawberry jam is made in Belgium, their Apricot jam is made in Argentina, their raspberry jam is made in Poland, and their aluminium foil is made in China. If you are a supporter of Australian born products, you may want to pay attention to the place of manufacture before you buy another Home Brand product. Posted in Living in Melbourne | Comments Off on Is Home Brand for real?